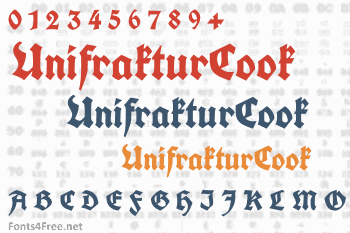 UnifrakturCook is a blackletter font. It is based on Peter Wiegel’s font Koch fette deutsche Schrift which is in turn based on a 1910 typeface by Rudolf Koch. While the glyph design of Peter Wiegel’s font has hardly been changed at all, UnifrakturCook uses smart font technologies for displaying the font’s ligatures (OpenType, Apple Advanced Typography and SIL Graphite). An experimental feature is the distinction of good blackletter typography between required ligatures ‹ch, ck, ſt, tz› that must be kept when letterspacing is increased, and regular ligatures (for instance, ‹fi, fl›) that are broken up when letterspacing is increased. Using the ligatures: Whenever you type a sequence such as ‹tz›, it will automatically be displayed as a ligature. When you want to oppress a ligature, for instance in the German word «Zeitzone» ‘time zone’ that should have no tz-ligature, then you put a zero width non-joiner between the ‹t› and the ‹z› or, alternatively, you write «Zeit‌zone» in the HTML code. Unfortunately, this will only work on a browser that is capable of displaying ligatures. Of course, UnifrakturMaguntia provides the character ‹ſ› (U+017F LATIN SMALL LETTER LONG S)! UnifrakturCook is optimized for @font-face linking on the internet by combining standards compliance with a permissive license. UnifrakturCook has first been published in 2010 at UnifrakturCook. It has been edited with FontForge, the libre outline font editor. OpenType features have been added with FontForge directly. AAT features have been added with ftxenhancer of the Apple Font Tools. Graphite has been added with the Graphite Compiler. UnifrakturCook font contains 245 defined characters and 220 unique glyphs. 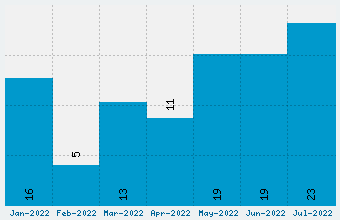 The font contains characters from the following unicode character ranges: Basic Latin (93), Latin-1 Supplement (95), Latin Extended-A (8), Latin Extended-B (1), Spacing Modifier Letters (4), Combining Diacritical Marks (9), Latin Extended Additional (1), General Punctuation (17), Currency Symbols (2), Letterlike Symbols (4), CJK Compatibility (1), Private Use Area (2), Alphabetic Presentation Forms (6). 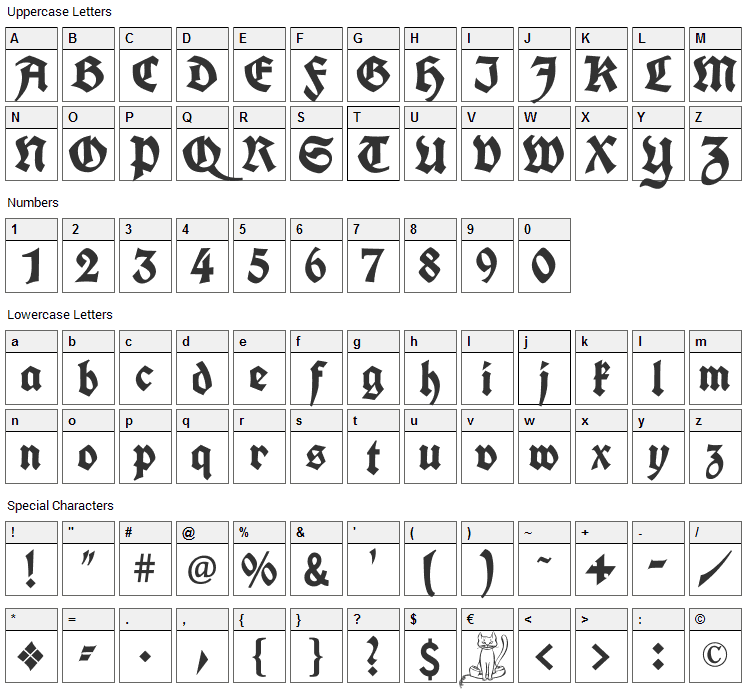 UnifrakturCook is a gothic, medieval font designed by J. Mach Wust. The font is licensed under SIL Open Font License. The font is free for both personel and commercial usages, modification and distribution. In doubt please refer to the readme file in the font package or contact the designer directly from profiles.google.com.